On April 3, 1917, the International Brotherhood of Teamsters chartered the Seattle Laundry and Dye Wagon Drivers as Local 566. Laundry owners refused to even acknowledge their existence. The very next day, in fact, D.C. Keeney and his fellow owners framed a response by chartering a Seattle Laundry Owners Club. Seattle laundry owners did more than just incorporate. They also signed a "blanket lease," under which each became a co-lessor of the others' plants. This lease created a Club "holding committee", one empowered to seize any plant whose owner agreed to union terms. The penalty for breach of this agreement was to be $5,000. Seattle's laundry owners were digging in - just after they had raised laundry prices between 10% and 25%. Their workers, who gained no money from this rise, were restive. In early June of 1917, Seattle had just two "union laundries"  Central Wet Wash, which employed Dave Beck, and the union's Mutual. But Local 24 was at last beginning to grow; from 94 members in 1916, it now stood at 118 members. On June 12, 1917, Local 24 held a special meeting, to initiate another 100 new members. Then at 9 am on Thursday, June 14, 1917, seven hundred laundry girls (out of 1,600 inside workers across the city) unexpectedly struck. At the union meeting that week, they had been told the owners were going to fire all union members at the end of the week. Instead, the girls voted for preemptive action. Arriving to work as usual at 8 oclock on June 14, the laundry girls worked an hour and then staged a walkout. Keeney and the other 16 members of the owners club declined to meet at all with these strikers, claiming "[we] positively refused to accede to union demands." The Union Record immediately backed up their claim  with front-page photographs. These displayed the checks of two experienced women laundry workers. One had earned $5.97 for the week; the other, $8.62. By the evening of June 14, 1,100 women were on strike; 20 of 24 laundries in the city were standing idle. 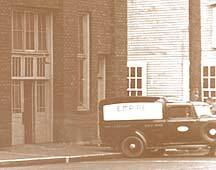 By June 15, Keeneys Seattle Empire Laundry was wholly shut down. Only eight of the citys 24 larger laundries were in fact operative (five of these were union shops, the other three were using strikebreakers). Within days, the laundry girls were joined by other strikers: Local 40 (the Steam and Operating Engineers) and the recently-organized Local 566. In four days, between 1,200 and 1,500 workers, drivers and engineers had walked off their jobs. When the drivers struck in aid of the laundry workers, it was despite their bosses' offer of stock in the laundries  in addition to better percentages. The newspapers reacted in panic at the drivers' defection, publishing headlines like "Paper Collars and Towels Loom as Substitutes." The Laundry Owners Club remained immovable; they were prepared for "a fight to the finish against union shops." By June 19, however, all plants except those in the Laundry Owners Club and the West Seattle Laundry came to terms with the union. Shortly after the start of the strike, James F. Brock had arrived in Seattle. As President of the International Union of Laundry Workers, he provided considerable weight and publicity for the workers cause. Despite the fact that all their operations had been clearly crippled, the Owners Club took newspaper ads in which they claimed "all the seventeen plants are in operation." Such claims led to angry editorials elsewhere. The Union Record took the Club to task for lying, calling its members "martyrs to the cause of dirty linen and dirty methods." By June 16, the Union Record was logging those laundries which had been especially brutal to union organizers. Keeneys Seattle Empire was number two on their list. The Record also noted, that from its inception, the strike had "crippled" these laundries; it noted most plants were "forced to close down entirely."